Everyone who visits me knows I just adore anything with a sewing theme and this piece I loved playing with - I think it is very different for me. I actually made it some time ago but not had the time to blog it. Can you see what the actual container is? Take a guess. 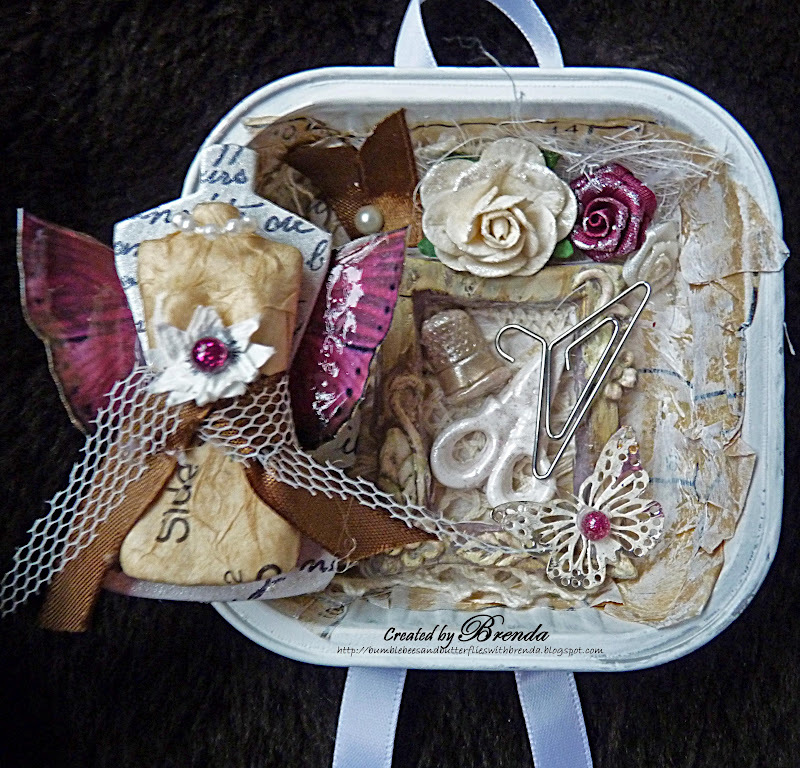 I have used a vintage dressmaking pattern, several clay moulds, fabrics and other embellishments to finish it off. Not long before I finish work and then I will be able to visit you a bit more. I think it looks like a tin of Caesar (or the cat equivalent!) Brenda but FABULOUSLY (obviously!!!) altered! This looks amazing. My guess is a sardine can.... or something else fishy!!! This is indeed lovely sewing container, how clever of you to make it out of an Ice-cream container!!!! That is my best guess. I am gazing at all your embellishments, the more I look, the more I can see, I love it when someone posts a piece full of cornucopia as I spend quite a bit of time drooling. I would say it is a sardine can, but sure looks quite lovely in the new and improved altered state! Lovely as always! Hugs! Hi Brenda ive been so busy lately so I am catching up on viewing everyones older posts and bringing myself up to date. I love this blog you have such skills, I cannot sew for the life of me, ( my right had doesnt work properly) but I used to be able to and miss it. So cool, love your altered tin. Looks like a tin for cats or dogs food. Hi Brenda my jaw dropped in wonderment when I saw this little beauty, wowzer it looks superb, all those wonderful sewing items, absolutely beautiful, I bet you would decorate a dolls house to perfection, I go with the majority in that it looks like a tin that had pet food in.